This Independence Day, Americans across the nation will pledge allegiance to the flag and pay respect to our servicemen and women. Then they’ll dress in stars and stripes, and head outside for some barbecue before watching a fireworks display. If you’re feeling festive, we found an assortment of gadgets and gear that will make your holiday more entertaining, more relaxing — and yes, way cooler. This heat-resistant silicone mitt from Wayfair has an American flag-inspired design and retails for less than $10. It comes in white or blue, so you can pick the version that matches your style — or your apron. 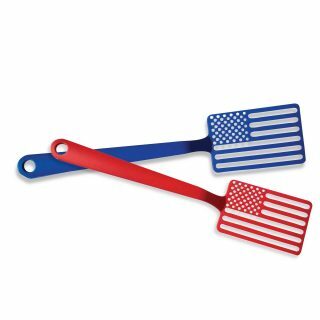 An American flag-emblazoned spatula won’t make your barbecue taste better, but it’ll sure make you look the part of a patriotic host or hostess. And when you’re done dishing out burgers, it’s dishwasher-safe. This kitchen tool comes in blue or red and costs $9.99 at Bed Bath & Beyond. This red, white and blue cooler from Oriental Trading Company has a 16.5-inch diameter space that you can fill with ice and drinks, and it’ll cost you only $12.48. Want your barbecue to look patriotic even when it’s not in use? This American flag grill cover is designed to fit most standard to large gas grills, at 68.5 inches long by 35.25 inches wide by 21.25 inches high. Buy it for $14.97 from Amazon. 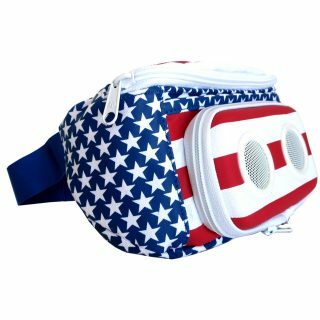 You’ll hear “The Star-Spangled Banner” loud and clear as it blasts through this American flag fanny pack, which doubles as a Bluetooth-enabled speaker. You can purchase it for $69.95 from JammyPack. Take charge of your patriotic grilling party by donning a camouflage apron. This one costs $19.99 and is covered with plentiful pockets including those for ketchup bottles and soda cans. It also has an adjustable strap, making it a fit for grill sergeants of almost all sizes. Check it out on Amazon. Pool floaties are trendy this summer, and the more elaborate, the better. This particular inflatable raft measures 8 feet in length, can fit up to two people, and is shaped like a bald eagle. It’s available for $44.99 from Wal-Mart. Oh say can you see … by the light of this umbrella speaker. Sharper Image sells this $59.99 Bluetooth patio umbrella speaker that doubles as a light and is ideal for entertaining. Fit it around the top of your umbrella pole and enjoy its LED light coupled with its dual three-watt speakers, which are compatible with smartphones and tablets within up to a 100-foot wireless range. The device can provide up to eight consecutive hours of music and light. Still need additional party essentials? Keep an eye out for Fourth of July sales. Deals will reach their peak in the final few days before the holiday.